SUPER EFFICIENT GEOTHERMAL Groundwater Heating and Cooling. 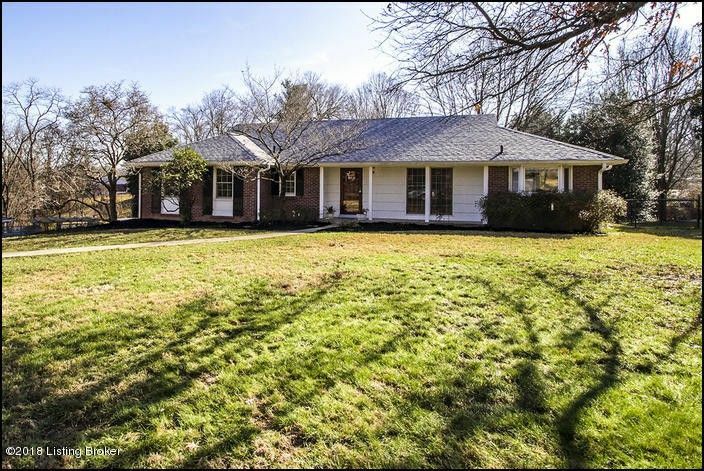 Exceptional Brick Walkout Ranch, Desirable Area. Beautifully refinished red oak hardwood floors throughout the spacious living areas. Excellent views out to your beautiful 1/2 acre lot from your picturesque living room, your private deck and the oversized eat-in kitchen den area. The living room is huge, a spacious formal dining room three large bedrooms and two remodeled full baths. There are two wood-burning fireplaces, in the living room and family room in the basement. A third gas fireplace is located for cozy evenings by the fire in the den area. There is a fully fenced-in pet yard just off the deck. The exterior eves are wrapped in vinyl for low maintenance along with newer double pane windows throughout the home. The attic has had additional insulation added. The home has been upgraded for maximum efficiency and low maintenance. A new roof was installed in 2018 and to top it off an amazing Groundwater Geo thermal heating and cooling system by Bosch with the following features:aHoneywell thermostat controls with internet control and reportinga50% savings on utility cost based on conventional gas and electric systema70% domestic hot water savings (the heating portiona97% Super high efficiency gas backup heata97% Super high efficiency domestic water heating (high recovery with virtually endless hot water)aPowered humidification for winter time operationaPowered dehumidification for summer operationaBalance of the 10 year parts and Labor warranty from Bosch the manufacture.Typically a furnace needs to be replaced about every 15 years at the cost of several thousand dollars. AC is similar. Geothermal does not need to be replaced. It is also more efficient than a furnace or air conditioner. Geothermal in Louisville is not rare. All windows have low-E glass coating which keeps the heat inside in winter and helps fabrics from fading if by the window. The windows screens are an upgrade from the regular screens which give you a more clear view of the outside. A solar powered attic fan will aid in keeping the home cooler in hot summer months. The deck flooring is TREX not wood and therefore low maintenance. No sanding or staining, just pressure wash occasionally. No replacing of rotten boards.The home comes equipped with all kitchen appliances including the near new washer and dryer. It is move-in ready. Further, the garage is huge, very deep and a large storage area adjacent to the parking spots the size of another car. Just over 800 sq feet. One of the two garage doors has a batter back up system in the event of a power outage, you can still open the door. The partially finished basement has a family room with wood burning fireplace and a walkout doorway to the large private patio. There is a separate storage area in the basement with some shelving. Directions: From inside the Watterson, Brownsboro Rd turn North on Blankenbaker Rd. Then 3rd Right turn onto Smithfields Rd. It will bend to the left then turn right onto Hanford Ln.The home is the 4th house on your right.